Ashburton Grove - Arsenal news and Arsenal opinion: Jack's new deal - Chamberlain fee agreed - United's £20m Nasri bid? Jack's new deal - Chamberlain fee agreed - United's £20m Nasri bid? I hope you're all geared up for a busy week. I'm ready with a large supply of both Red Bull and Pro Plus to keep me going. All the signs are there that we'll announce a number of deals this week before the players come back for pre-season. But remember, this is Arsenal and nothing is that easy. We'll start with some good news and that is brought to us via the Sunday Mirror who are reporting Jack Wilshere is to be offered a new long term deal with the club. The offer being made to Jack is £50,000 a week for five years. I know it only seems like yesterday the club put him on improved terms, but if we are to keep hold of him in the long term handing him a deal like this is the only way. I would say that Jack's name is now one of the manager's first written on the team sheet. His rise through the ranks has been exceptional and I don't think this new deal is undeserved at all. He's now also one of Fabio Capello's first picks for England. What is now important is for the team to really compete in the league next season and for us to start picking up silverware. I'm sure that Jack will stick with us for a while if we still aren't winning anything but in the longer term it's more unlikely. He like us wants to be winning things and the club certainly need to match his ambition. Which brings me on to Cesc Fabregas. After The Guardian yesterday said we'd be willing to let Cesc Fabregas leave if Samir Nasri committed his future to the club, the Sunday Mirror are today running the exact same story. They believe that Arsene Wenger's budget to give Nasri the deal he wanted would be increased with the departure of our captain. Which is true it would be. 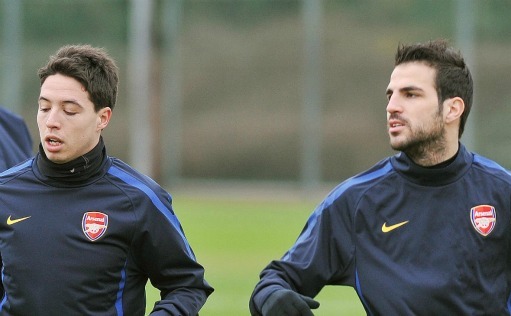 But does the Frenchman warrant the kind of money Cesc is on? Should Barcelona offer Arsenal a transfer fee which is in anyway acceptable to the club, I'm sure that Cesc would be allowed to return home. Their derisory offer of £27m isn't going to make Arsene Wenger budge. There are a number of stories that Arsenal are concerned about Cesc's hamstring injuries which could decrease the player's value. And whilst the club are always concerned about the fitness of their players, I'm sure Arsene Wenger doesn't think he has to sell Cesc now to get top money for him. The proof is in how he has performed on the pitch and the captain's numbers have been impressive these past two seasons as they have been before. Their has been no decline in his performances, just the number of games he's been able to play but that in part has been down to the fact he's not had a summer off for three years. The People are joining in on the act by reporting Cesc is prepared to give up his entitlement of 15% of his transfer fee in order to help grease the wheels of his transfer back to Spain. Which would of course leave Arsenal with the total transfer fee to play with. But the big question is how Arsene Wenger would spend it, if at all? The Sunday Times have a different angle on the deal, that Fabregas would take a pay cut in order to make it easier for Barcelona to finance the deal. They report the player is willing to not take a signing on fee and any future increments. Moving to Nasri, it's expected he'll sit down with Wenger this week. I hope that a new deal can be signed but since October until now when deals have been on the table for him and he's not signed, I'm not getting my hopes up about him committing his future to the club. The News of the World are reporting Manchester United are going to make a £20million bid for the Frenchman this week. Like I said yesterday, if Nasri had no intention of considering staying with us why would he agree to sit down with Wenger? I hope the club can reach a compromise with the player. It wouldn't be good for either party for the Frenchman to go into the last year of his contract being uncommitted to the club. We'd have to sell him and for me it would have to be abroad. Where ever his destination, it would have to be agreeable to both the player and Arsenal. The fee would have to be enough for Arsenal and the wages would have to be suitable for the player. There is still time left to run on this one. A quick round-up of other news. The News of the World say Arsenal are pricing Nicklas Bendtner out of a move away from the club because of the £12m fee they've slapped on his head. The People report that we're still in the hunt for Samba and Cahill. They say that Jagielka would be harder to sign as Everton don't want to sell. And back at the News of the World they report Neil Banfield is front runner to be Arsene Wenger's new assistant when Pat Rice retires. And finally, the News of the World say we've finally reached agreement with Southampton for Alex Chamberlain. They report the transfer fee will be £8m with an additional £2m in add-ons depending on first-team games and England caps.